Sick of fighting traffic to and from your job? It’s time to unclench your fists and look at the facts when it comes to your daily commute. 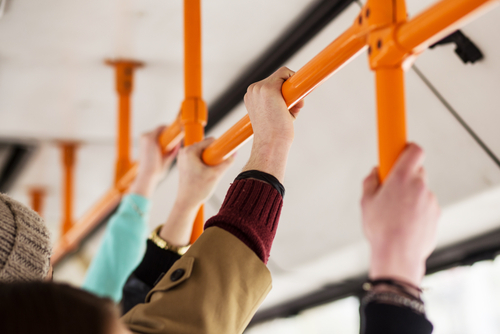 Could you be saving time and money by taking public transportation? Better yet, could you be more productive with one commuting option compared to another? Below are some pros and cons of using public transportation to help better your commute. When you’re driving, you have to focus on the road ahead of you. But if you take public transportation, you have time to finish up an assignment, read a book or let your mind wander. Plus, public transportation can help you better prepare for the day or night ahead. The first big con when it comes to public transportation is that you’re stuck on the system’s scheduling and pricing. It might take longer to wait for your bus, sit through multiple stops and still have to walk or drive home. Also, with fluctuating gas prices, some months it may be cheaper to hop into your car than to take public transportation. Using public transportation is good for the environment as you’re emitting less pollution into the air. According to the Federal Transit Administration, using public transportation can: improve air quality, reduce greenhouse gas emissions, save energy and minimize impacts. And on top of being environmentally friendly, you’re also beating out traffic! If public transportation isn’t widely offered in your community, consider carpooling with fellow coworkers in order to save on fuel. With public transit comes sharing a ride with the public. On the one hand, you can meet some really interesting people within your community and have more real world interactions on a daily basis. However, you can also see the ugly side of your community or be stuck talking to someone when you would rather read a book. Plus, after a long day in the office, the last place you’d probably want to be is in a crowded subway car. Whatever you decide, keep these tips in mind when looking to change or enhance your daily commute.